Visitors to the IISD Experimental Lakes Area facility should expect a wide range of temperatures and conditions while on site, so please remember to dress for the weather and come prepared. For those who are planning extended stays at IISD-ELA, please review the below checklist for equipment that is available at camp, as well as some recommended equipment to keep you comfortable throughout your stay. If you have plans to travel to IISD-ELA, please note that Pine Road to the facility is a controlled, restricted-access road. The Ontario Ministry of Natural Resources and Forestry (OMNRF) requires that all vehicles carry a valid travel permit. Arrangements for short-term travel permits for IISD-ELA-related activities can be made by contacting Roger Mollot, Operations Manager at 204-229-4755 or John Neall, Facility Manager at 807-226-5162 ext. 230 or 807-220-0794. For all other requests, please contact the Dryden District OMNRF office. Travel permits are issued to cover only direct travel between Highway 17 and the IISD-ELA field station. 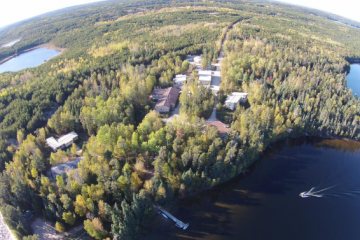 Personal parking along Pine Road between the Stewart Lake bridge and the IISD-ELA field station is not permitted. IISD-ELA also arranges travel to and from the facility from Winnipeg and Kenora. For these arrangements you can contact Roger Mollot, Operations Manager at rmollot@iisd-ela.org or 204-229-4755.